I feel like a heretic giving River Jordan’s “Praying For Strangers” only 3 and ½ stars. In my rating system that means I enjoyed the book and I’m glad I took the time to read it. I can recommend it to others but I wouldn’t have them stop what they are doing and get it immediately. If you read the reviews on Amazon you will quickly find that my opinion is NOT shared by anyone. 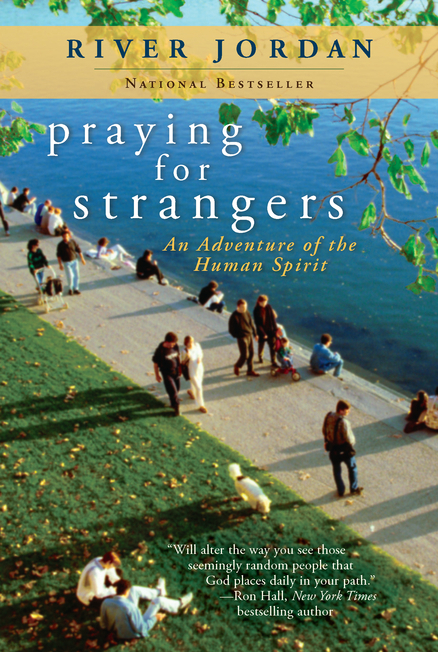 There are 39 reviews for “Praying For Strangers” on Amazon and all 39 have awarded this book FIVE stars. Maybe, like me, no one wants to be the first to offer a contrary opinion. First of all, it took some time to fully believe that someone named River Jordan is writing a book with a religious theme. Actually, it was more difficult to grasp that she is an accomplished author who has written several books and they do NOT have a religious theme. Toward the end of 2008, as Ms. Jordan was contemplating her New Years resolutions; she was both sad and fearful because both of her sons were going off to war, one in Iraq and the other in Afghanistan. It came to her that rather than focusing all her thoughts on her own worries she should force herself to think about others. And what better way to do that than to find a stranger each day to pray for. She began to find them everywhere in the course of her daily travels. It was like someone was choosing them for her; the woman in front of her at the bank, the guy with whom she collided shopping carts, the traffic guard at the local school. She would find them and offer special prayers for them on that day. I think all of us could do that but Ms. Jordan felt it was important to let each of these people know she would be praying for them that day and inquire of them whether they had any special needs that she should focus on while praying for them. This is what makes the book what it is. It takes some courage to open yourself up to others and this didn’t come easily to River Jordan. She was amazed at the positive responses she received and how this one little offering on her part seemed to make such a difference to so many that she encountered. Praying for Strangers is an uplifting account of how one person can make a difference in the lives of others. It is also a testament to the power of prayer. Finally, it affirms that we aren’t really strangers to others and that we all face each day trying to do the best we can and we are joined together in that noble pursuit. It’s a book worth reading and I gave it ***1/2 stars.